Online advertising with Google Ads, formerly known as Google AdWords, is one of the most effective ways to reach new customers and grow your business. However, before you can get started, you’ll need to know how to use AdWords effectively in order to maximize the return on investment from your advertising spend and avoid making mistakes. Google Ads (AKA Google AdWords) is the online advertising platform owned and operated by Google. It is also the largest and most widely used online advertising network in the world, and millions of businesses advertise online using Google advertising to reach new customers and grow their business. Advertisers who choose to use Google AdWords can target users across two main networks – the search network, and the Display network. The search network refers to pay-per-click advertising, in which advertisers bid on keywords that are relevant to their business and have a chance to display their advertisements to users who enter those keywords into Google as part of a search query. Pay-per-click advertising is also known as paid search. The Display network offers advertisers the option of placing visual banner-style advertisements on websites that are part of the Display network. The Google Display Network reaches approximately 90% of global internet users, a vast potential audience. Although both search and display advertising campaigns are managed via Google AdWords, the term “AdWords” is typically used to refer to the search network. Digital marketers usually refer to the Display network by its own name. The below graphic outlines a proven roadmap to AdWords success in elevent steps. If you're new to Google advertising, follow these tips! Before you can start advertising on Google AdWords, you’ll need to set up an AdWords account. Setting up a new AdWords account is easy, and takes just a few minutes. You have the option of creating your account using an existing Google account, or you can create a new account specifically for use with Google AdWords. Then, you’ll specify some basics for your account, such as your location and time zone. Finally, you’ll set up billing details, so Google can accurately bill you every month. For a full guide to setting up your AdWords PPC account, read this PPC University lesson. If you’re only planning to run a single campaign, your AdWords account structure will likely be quite simple. However, if you intend to run multiple campaigns simultaneously, or plan to do so in the future, it pays to consider optimal account structure from the outset. There are several ways you can structure an AdWords account, depending on your needs. For example, you can structure your AdWords account based on the structure of your website, by the types of products or services you’re advertising, or by geographic location, if your business operates in several individual markets. For more information on how to structure your AdWords account, read this lesson at PPC University. Now that you’ve set up and structured your AdWords account, it’s time to examine the fundamental building blocks of what makes AdWords work – keywords. As their name implies, keywords are key words or phrases that users enter into Google when performing a search to find the information they need. AdWords works by allowing advertisers to bid on keywords that are relevant to their business so that their ads are shown to users when these keywords are entered. Advertisers bid on keywords, rather than “buying” them outright, because AdWords functions in the same way as an auction to ensure that not only advertisers with the largest budgets can succeed with PPC. For more on the AdWords ad auction and how the AdWords system works, check out this infographic. Before you can bid on keywords, you need to know which keywords are worth bidding on. This is determined during the keyword research phase. There are many different ways to conduct PPC keyword research when launching a new AdWords campaign, and WordStream’s Free Keyword Tool is an excellent starting point. Simply enter a search term to begin, and WordStream’s Free Keyword Tool will generate a comprehensive list of keywords related to the original. You will also see data for the relative frequency of the related keywords, the search volume (using data from both Google and WordStream), as well as the keyword’s competitiveness. WordStream Advisor, our PPC and social media advertising management platform, also features a comprehensive suite of keyword research tools that enable you to find new keyword ideas, identify keyword niches, find negative keywords to exclude from your campaigns, and much more. Sign up for a free, no-obligation trial of WordStream Advisor today to see how WordStream can help you grow your business with paid search. Once you’ve identified the keywords that are relevant to your business, all that’s left to do is write compelling, persuasive text ads that simply beg to be clicked. Although Google AdWords offers a wide range of diverse ad formats, text-based PPC ads form the core of AdWords. Writing ad text is a particularly challenging task, not least because of the space restrictions that advertisers are subjected to. You only have very limited space to craft a compelling message that speaks to your prospective customers and persuades them to click on your ad. There are many elements to consider when writing PPC ad text. Your choice of language is crucially important, and can have a dramatic impact upon the tone of your advertisements. Some ads leverage emotional responses such as fear or even comedy to tempt visitors to click on them, whereas others capitalize on special offers to make their ads more compelling. If you’re pressed for time or looking for a starting point for your ad copy, you can also download 288 PPC ad copy templates from this blog post, which includes everything you need to get started writing your own unique, compelling ad text. Taking the time to regularly adjust and optimize your account is one of the most important things you can do as a paid search advertiser. However, even if you’re doing everything right, it can be difficult to know just how well your campaigns are performing. 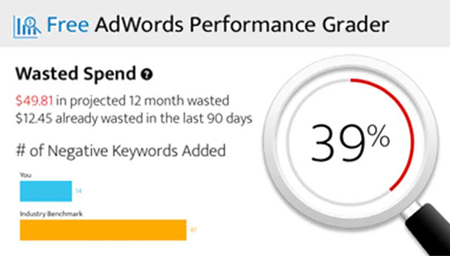 That’s why WordStream created the AdWords Performance Grader. No other free tool provides as much unique, individualized insight into your Google Ads account performance as the AdWords Performance Grader. To see how well your account is performing, and to identify areas in which you can improve, try the AdWords Performance Grader for free today.